The Dream of the ’80s is Alive in Chicago. You’ve gotta love the last two decades of the 20th century, man. Movies, tunes, and toys from that era just seep nostalgia out of their plastic joints and turntable arms. 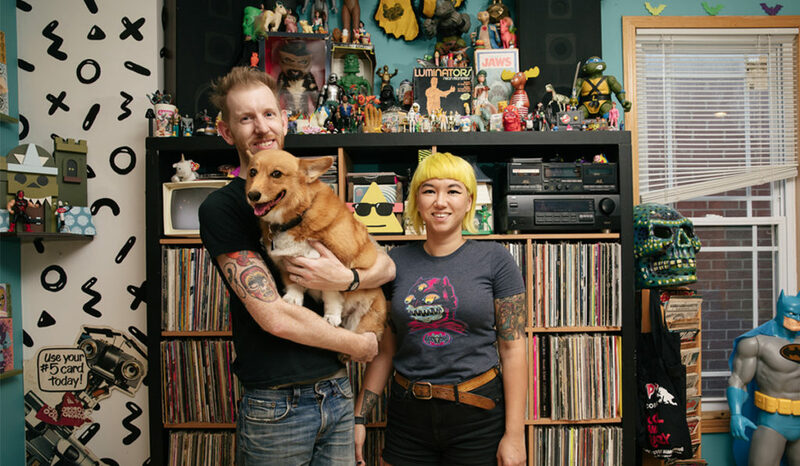 And the owners of Chicago’s Bric-a-Brac Records, Nick and Jen (who used to be a photographer here at Threadless), have made a living and lifestyle out of all things nostalgic. 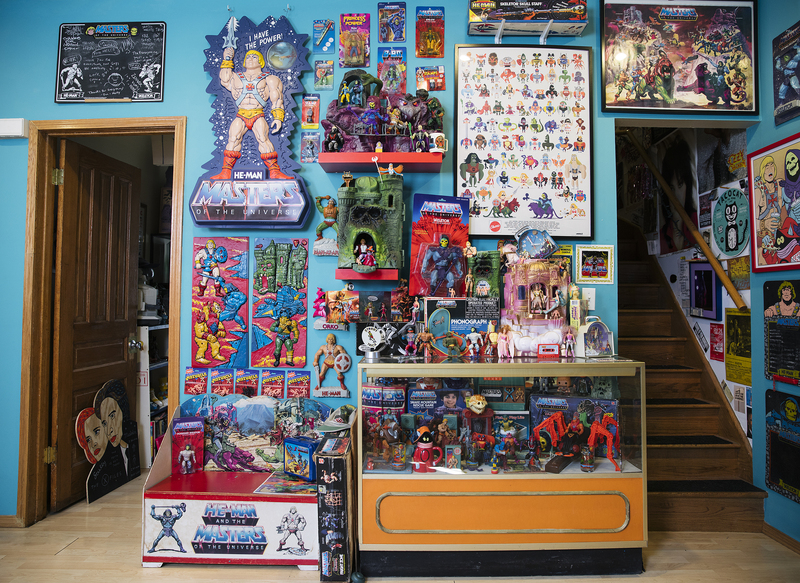 These two rad Chicagoans have turned their home and their business into nothing short of a time capsule and museum of collectibles, movie posters, and music that serves as a direct line to the ’80s and ’90s. 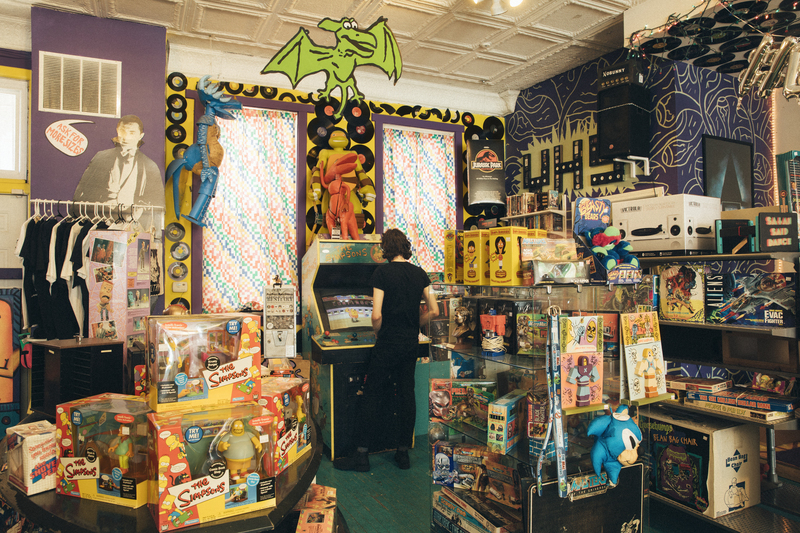 We talked to Jen and Nick and stopped by their home and Bric-a-Brac storefront to get a little nostalgia fix of our own! Check out their amazing spaces! First things first, tell us a little bit about yourselves! 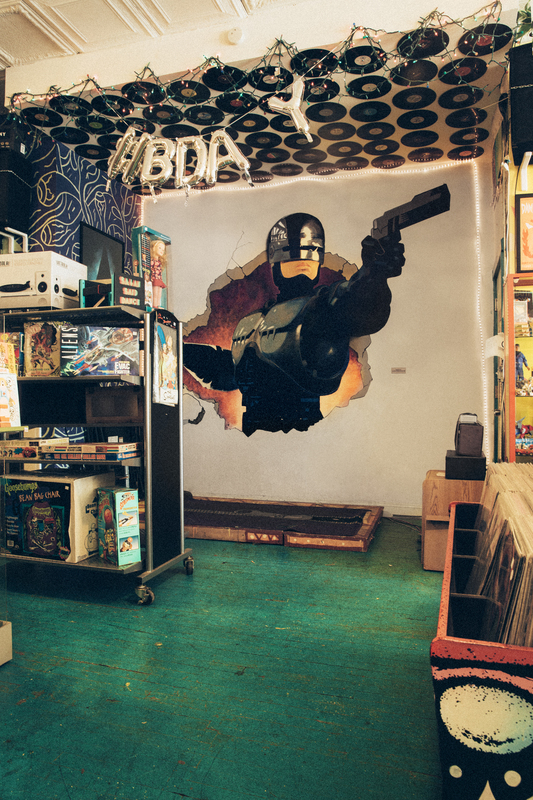 How long have you been collecting awesome vintage toys and awesome things? 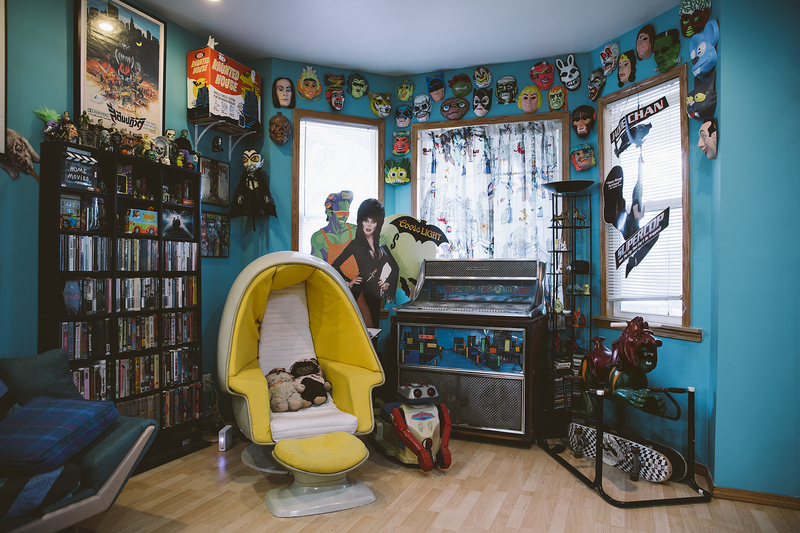 JEN: I grew up with parents who love pop culture and collecting things. Although their collections are a lot smaller than mine, we often went to thrift stores and flea markets together. I can remember the first flea market I went to; it was in the drive-in movie theater lot in my hometown. I guess I have been collecting as long as I can remember because my mom is kind of a pack rat and I still have a lot of my toys from when I was younger. But that being said, I had siblings, so toys weren’t always in the budget and now that I am an adult, I can buy all the toys I thought I had missed out on as a kid. When I was 17, I found a record store where I got a Pat Benatar record for .50, and I remember thinking “Wow! Why am I spending $15 on CDs?” I bought the record before I even had a player and for my 18th birthday, my parents got me a record player and my dad gave me his entire collection. After that, I never stopped buying records. It’s fun because music is a black hole, and you can just get sucked into it finding new bands that sound like your favorites and who influenced them and who was influenced by them. I don’t think I will ever be done collecting those. 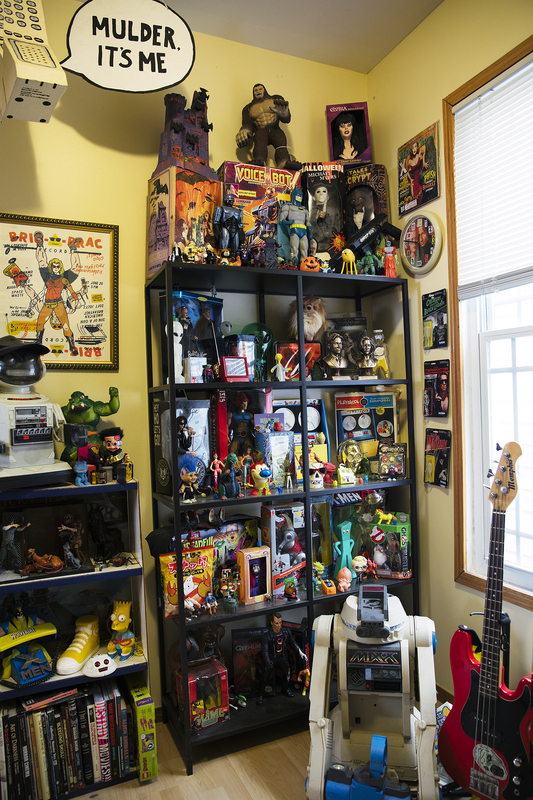 NICK: For me, I guess collecting things has been a way of expressing myself. I did grow up with toys but wasn’t really driven to flesh out a specific collection. 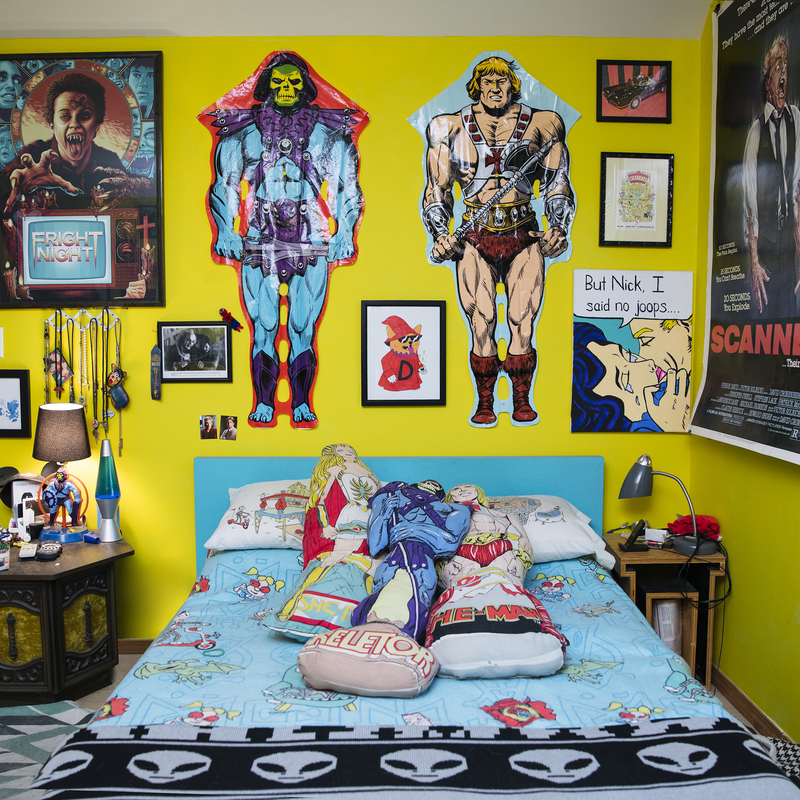 As a teenager, I was more into decorating my space and myself. My walls were covered with posters and pages out of my skateboarding magazines, my car was covered in stickers, and I would draw on myself all the time in class. My parents were very encouraging of being an individual and I was not afraid to let everyone know how individual I was. The same mentality has followed me into adulthood- I’ve got a huge poster collection (but now they’re up in frames instead of with masking tape), our house is filled with our awesome things, and now I pay other people to draw on me permanently. 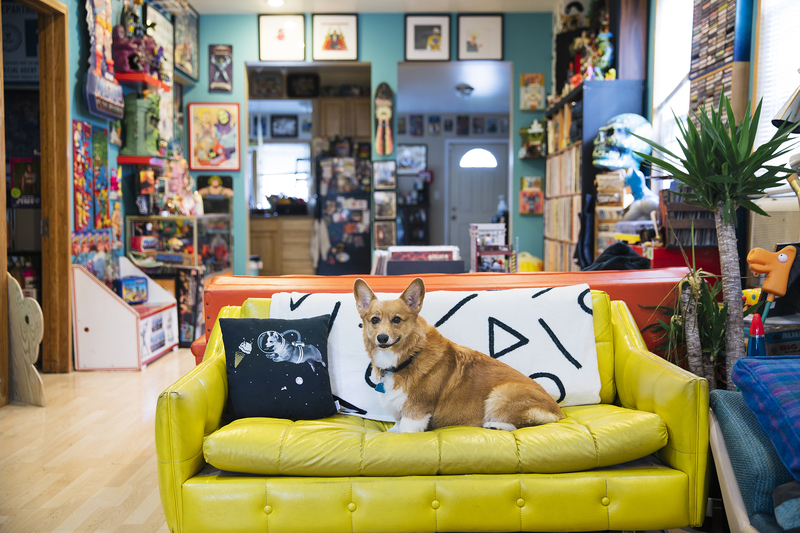 Pillow: “Corgi-Naut” by Phil Tseng | Blanket: “Party Pattern” by Katie Lukes. How many figures and items do you have in your collection? Haha! That’s a hard question to answer, maybe you can look at the photos and try to count. We certainly never kept track! More than 200, less than 2 million. This is a heavy question: favorite collectible in your collection, and favorite retro movie/tv show/music group, GO! JEN: I have two personal favorites; one is our Battlecat Ride-on that I spent an entire weekend at C2E2 trying to haggle a guy down for. It started at $500 and I finally got him to agree to $417 after the show had closed and we were both packing up our booths. It was awesome to carry the huge prize out of the convention center and then try to squeeze it into our van. The other is a He-Man lamp that a friend of mine gave to us because he knew we loved He-Man. He’s the frontman for one of our favorite bands and it was his as a kid, so that made it extra special. On top of all that, it turned out to be one of the more rare products in the whole line of MOTU merchandise! As far as my favorite old movie, it’s a three-way tie between Rock N’ Roll High School, Batman Returns, and Clash of the Titans. The best TV show is, hands down, The Golden Girls, and music…that’s a loaded question. I love a little of everything but my favorite singer is Cyndi Lauper! NICK: Heavy indeed! This is like picking a favorite child. I think something up around the top would be my Frankenstein drinking glass from 1980. I found it at a flea market in my old college town for $5 and had never seen anything like it before. The colors are so vibrant and the illustration is so amateurish that it stole my heart immediately. Much like the He-Man lamp, it’s actually super hard to find! It’s from a series of Universal Monsters glasses, so now I must complete the collection! My favorite movie is Knocked Up, show is Joey, and The Ramones are the best band ever. 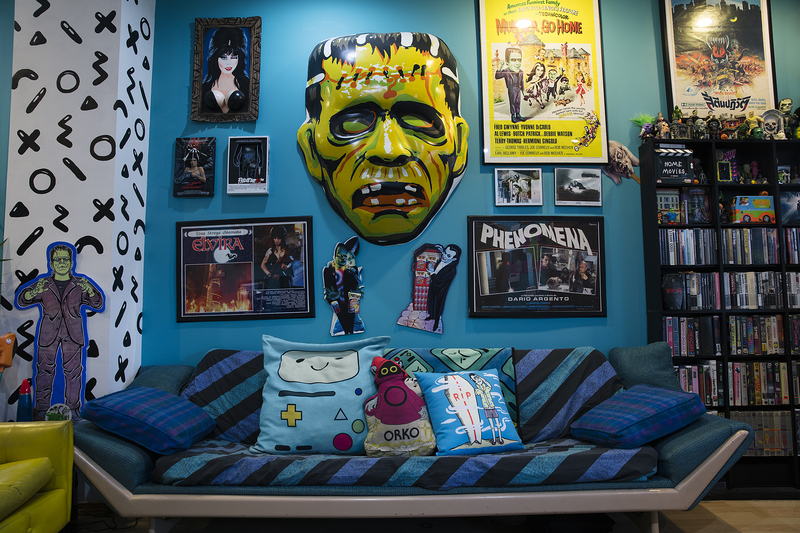 Pillows: “B-MO!” by Jessica Laroche and “Surf Dracula” by Jen Lemasters (Bric-a-Brac’s Jen!) and Jillian Fisher. 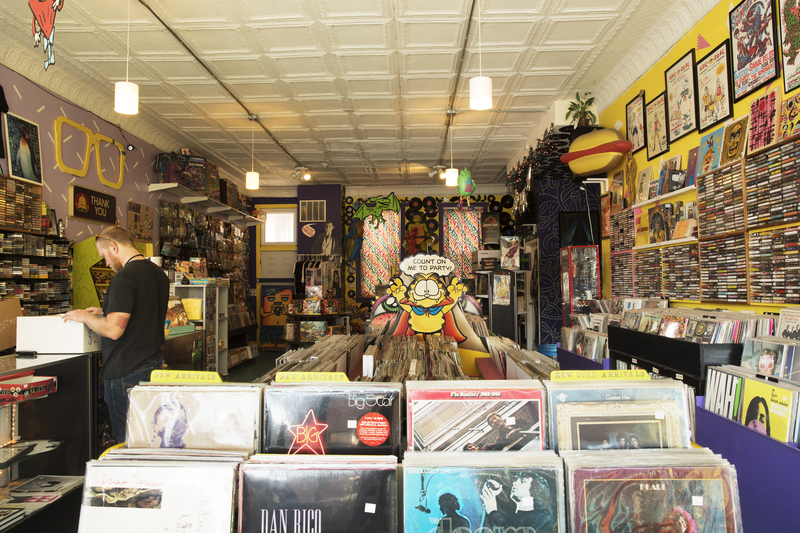 You also turned your passion into a career and you own one of my favorite places in the city, Bric-a-Brac records! What’s it like owning such a rad place! Owning a business is a ton of work. Especially since it’s such a fun place, it seems like people don’t always realize that. We love surrounding ourselves with all of our favorite things, but there’s so much more to it than just that! Even though it is a ton of work, it has definitely paid off in a lot of ways. We have made a lot of great friends because of this place, ones with VERY similar interests, and have been able to meet and work with some of our favorite bands. Plus, treasure hunting is now our “job” and we’ve been able to hunt down some of our holy grail collectibles! How long has Bric-a-Brac been in existence? Bric-a-Brac just turned four in June! 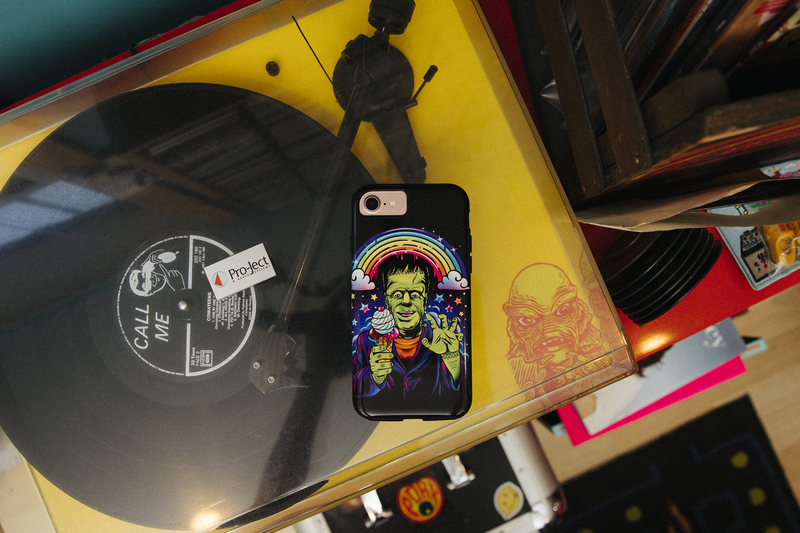 Phone case: “Lisa Frankenstein” by Jen Lemasters, Dandingeroz, and Jerry Maninang. How do you find new things to include in your store? 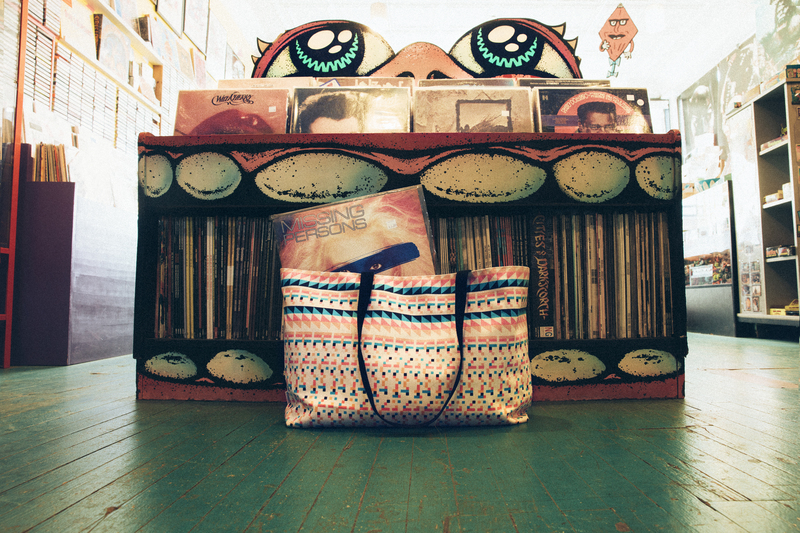 When you’re looking for cool new vintage things to sell in your shop, do you ever end up snagging them for yourself? We use all kinds of ways to find new products for our shop. Everything from going to flea markets, estate sales, toy fairs, having people bring us things, all kinds of treasure hunting. Do we ever keep things we snag? YES! 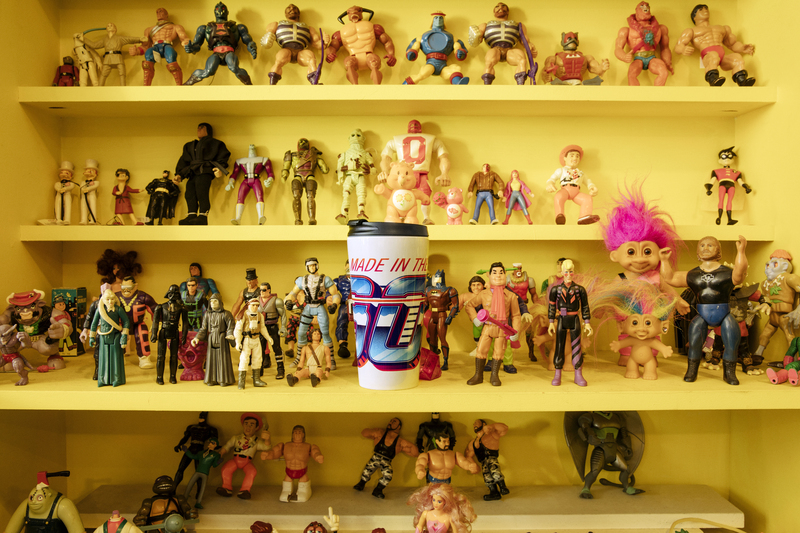 Travel mug is “Made in the ’80s” by Signalnoise. 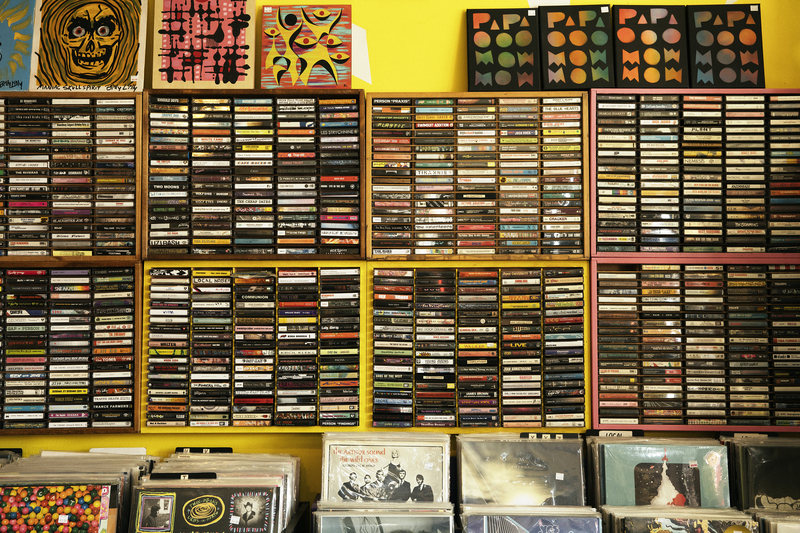 What do you love most about vintage collectibles? JEN: For me, I love the hunt. I love the nostalgia, and I love having a place to come to and see all of my favorite things. It really de-stresses me to feel surrounded by things I love. I have always kind of thought of my house/collection as my Fortress of Solitude/Little Mermaid’s treasure cave. NICK: I think these pieces really represent a by-gone era where there was so much more craftsmanship and artistry in the design of toys and merchandise. The majority of products today are really a reflection of our culture of disposability and ephemerality and lack the soul of the kind of stuff they churned out 30 years ago. If we’re gonna trash the planet, at least do it with style! Party on, Jen! Party on, Nick! You can see more of Bric-a-Brac here. 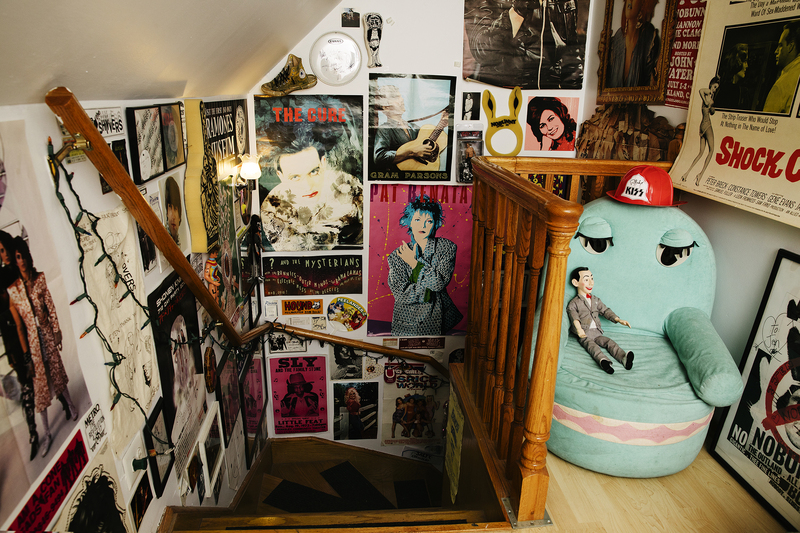 And check out more photos of Jen and Nick’s amazing home and store space below! 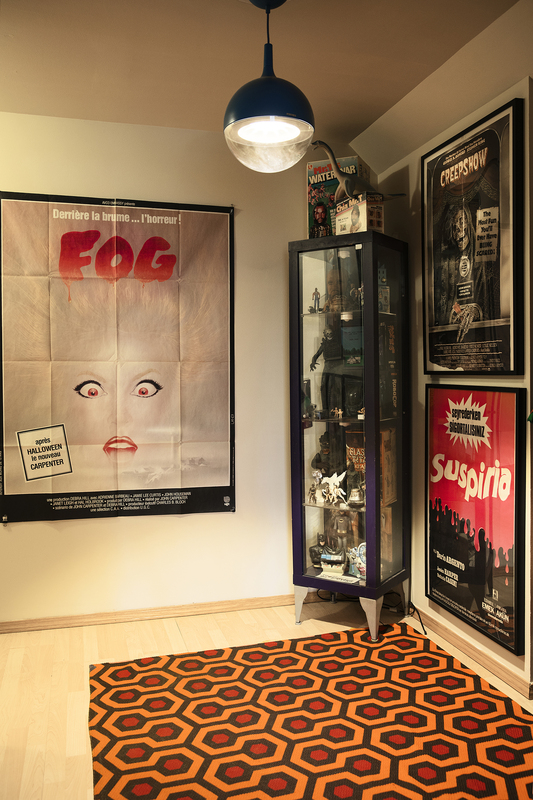 Jen and Nick’s museum-y space (rug is “The Shining Overlook Hotel Rug” by Jeff Speiser. Posted in Blog, Fun Stuff and tagged Bric-a-Brac records, chicago, vintage collectibles, vintage toys. Bookmark the permalink.